This group, a wonderful recommendation from Dan Niven who knows them professionally, was the perfect ending to a hectic two days of presentations, meetings, classes, walking labyrinths, eating delicious food, networking, and shopping in the vendor area. Participants were ready to boogie and Sea Star was easily up to the challenge! 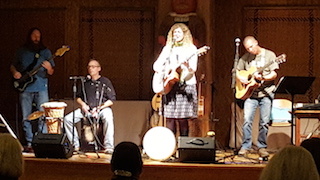 With a combination of traditional Celtic music, multiple acoustic instruments, and the velvet voice of Fae Weidenhoeft leading the way, SeaStar wove an historical and folkloric musical web for Gathering participants, many of whom leapt and danced in wild abandon alone and together in long conga lines. Suffice it to say, good fun was had by all.